He has been called the Godfather of free energy. A man who in the 1960s and 70s built fuel free power generators which could power the home, and flying discs which could travel the length and breadth of the UK in minutes. Professor John Searl, inventor of the Searl Effect Generator (SEG), and Levity Discs, now nearing eighty years old, has led an inspired but turbulent existence. From his early years spent in care homes and institutions, where he suffered an injury which rendered him partially deaf, through the years of developing his incredible inventions, he has been dogged with misfortune including the sabotage of his work by jealous colleagues and the theft of his research. The single minded pursuit of producing his Searl Effect Generators for the betterment of humanity has been a rocky path which has led to his house being burnt down, divorce, arrest and financial ruin. But he has been lucky too with a host of generous benefactors and fortuitous situations which allowed him to build his generators and Levity Discs (large flying discs known also as Inverse Gravity Vehicles). Development has as John puts it, always been a case of “… every step you take forward, you take two steps back”, due to inability to secure funding, but also due to direct sabotage of his work by those who wished to own it. And, due to the unwillingness of the establishment to embrace a technology providing free energy for all from a man who is not of the scientific establishment. John’s conviction now is as it has always been – he will not sell or reveal the secret information necessary to produce the SEG to corporation or government. 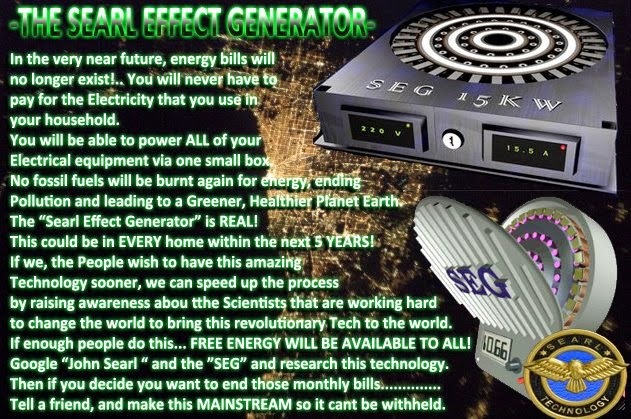 He will continue with dogged determination to bring The Searl Effect Generator to the world and herald the new age of free energy. With research into producing the SEG headed up by John’s friend and fellow scientist Fernando Morris going well in the US, we are lucky enough to interview John Searl in Glasgow before his recent re-location to the United States. In essence the SEG is a generator which harnesses magnetic forces all around us and utilizes a rare earth material, neodymium, to produce an infinite supply of pollution free energy. It’s construcion is circular, consisting of magnetic rollers rotating around a series of rings. It requires no power input to start and its parts experience no wear or tear . Because it generates an infnite supply of energy the SEG could completely replace fossil fuels and allow us to power vehicles, the home and industry at a fraction of the cost. When used in an Inverse Gravity Vehicle, the SEG generates an anti-gravitational field around the craft which can be directed for flight. Where did the inspiration come from to create such a device? From re-occuring dreams John Searl had as a child. In one of the dreams John found himself being approached by huge steamrollers whilst out playing hopscotch. During the six year period John was having the dreams and before his attendance at navy school, he had ten missing days during which he has “… no knowledge what happened.” His school records from the time simply said “disappeared.” It is a mystery to which, to this day, John has no explanation for. To my question, does he think someone or something was trying to communicate with him in his dreams, John speaks of a tribe over five thousand years ago who were, “using this mathematics” and “seeing through space and time.” They used the Law of the Squares to create buildings and even “flying machines” but were suddenly “wiped out”. He conjectures that a “meteorite hit the place” and that the survivors moved on and found another tribe to join. The knowledge was however retained in their minds and passed on but remained at a sub-conscious level requiring triggers to bring it forward. The trials and tribulations of John Seal have been well documented especially in Bradley Lockerman’s insightful documentary, The John Searl Story. 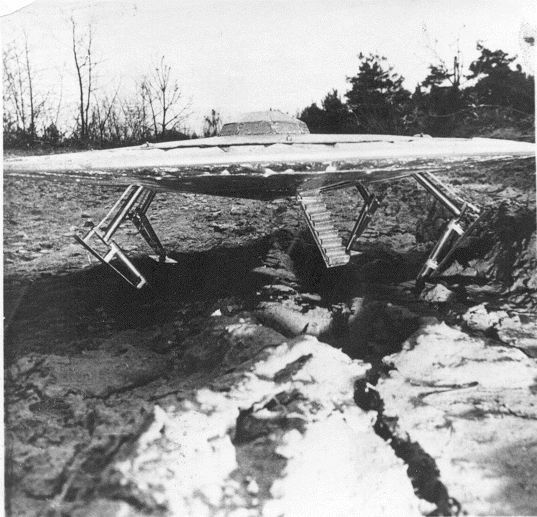 From its original development the SEG was a phenomenon. The famous case of the SEG smashing out through his landlady’s roof at 33 Crawley Road is told by John with humour and relish. His memories of George Haynes, the benefactor who originally funded the production of the Levity Discs, are good too and he recounts the words of this kind and thoughtful man “…if you can make people look up I’ll pay the cost.” And look up they did. During the 1960s and 70s John was demonstrating his fully functional flying discs to huge crowds in England and the world’s media. People commonly mistook his Levity Discs for UFOs around the skies of Warminster in Somerset. The BBC produced a regular report on Searl’s inventions but curiously, none of the footage showing flying Levity Discs has survived. John’s friend, Joanne Summerscales, tells us that someone with original footage may be coming forward in the near future and we hope that such evidence comes to light. John says he was in contact with John F Kennedy who wanted Edwards Airforce base to fund the development of the SEG. I ask if Kennedy had lived does John think he would have carried through the work? By the early 1980’s, John Searl, perhaps one of the most important inventors in history, was destitute, divorced and bankrupt. There has been some speculation that US Black Operations seized his technology and shut down his operation. And, that they have been developing craft based on the SEG ever since. What ever the reasons deliberate or otherwise, that John Searl’s technology did not become part of everyday life, he is now more driven and committed than ever to realize his life long dream. Despite lack of financial resources, indifference from the scientific establishment and sabotage, there is now real hope of bringing the SEG to the world for the benefit of humanity. There is a glint in John’s eye as he describes a world where developing country’s food production problems are ended, where the air is much cleaner, where household bills have gone down immensely and where humans travel throughout the galaxy. He says that the one invention he is most passionate about developing is the home domestic power plant, for the reasons that the electro-magnetic field generated by the SEG would keep dust and dirt on the ground not in the air, and that the SEG has the capacity to heal burns and scolding. John himself suffered 3rd degree burns on his face during an accident in the 1970s. Half of his face and eye were completely burnt but within 3 weeks spent close to SEGs, his skin had grown back, it was healed completely. We are close in this age to the realization of the dream of free energy. It offers a panacea of solutions to the world’s problems from the eradication of poverty to the cessation of global warming, but also poses possible cataclysmic consequences. It may present to humanity the opportunity to take our place amongst the stars with the civilizations who dwell there. There are groups such as the oil industry who have a vested interest in keeping this technology from mankind. But maybe the need is now too great and the time has indeed come to herald the new age of free energy. We can be genuinely hopeful if this breakthrough is to come from humanitarians such as John Searl, because ever since he has been aware of his extraordinary gift, he has insisted that the SEG be used for the greatest good. With great power comes great responsibility and John Searl must be commended for the integrity he has shown throughout his life in his endevour to develop the SEG for humanity and the planet. John Searl was interviewed by John Charleston for Voyager Spirit on 21st November 2010. Special thanks to Joanne Summerscales for arranging this interview. John Searl was born in 1932 in England and spent his childhood in various care homes and institutions including Dr Barnardo’s Homes. In 1946 whilst an employee for British Electrical Repairs Company in London, he created the first Searl Effect Generator, a device for creating fuel free energy by harnessing electro-magnetic fields. He realized it had anti-gravitational properties when it levitated by itself through the ceiling of his landlady’s house. He went on to create and demonstrate as many as 40 large flying discs based on SEG technology. By the 1980’s he had suffered a series of calamities including arrest for allegedly stealing electricity, and divorce, and was financially ruined. Research is now continuing in the USA to recreate and manufacture the SEG under the direction of John Searl and Fernando Morris. 60 years ago he didn't even have the technology we have now. Why is he struggling to get his own work replicated again? and what is costing millions to produce? I can't say with explicit knowledge, but just knowing how Corporate Over Control works, the current paradigm of fossil fuels, there is no way they would let this tech out. This is one piece of tech amongst thousands which have been suppressed. Hence Searls troubles I think. Chefchaouen Photo Diary Update - New Photos!